Hotel Ada Palace, Madrid. Ada Palace Hotel Madrid. Located in the historic quarter of Madrid, the recently opened Ada Palace offers our guests the perfect opportunity to explore everything that there is to see in Madrid. Situated at the beginning of the famous Gran Via of Madrid, and with is remarkable architecture, the Ada Palace is synonymous with modernism and efficiency, right in the heart of the city. 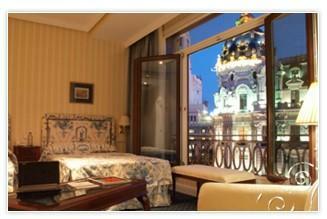 Theatres, museums and monuments are all easily accessible from our hotel. Our guests will be pleased to find that our 80 comfortable and contemporary rooms are equipped with all the necessary amenities. Guests can enjoy breakfast in the breakfast hall, overlooking the Gran Via and Alcala Street, or dine at our onsite restaurant, set in a luxurious atmosphere. Our corporate guests are welcome to make use of our auditorium and several meeting rooms outfitted with the most up to date equipment. The Ada Palace Hotel is ideal for travel and business trips alike, due to its central location in Madrid and its range of facilities.